As a result, content marketing has emerged as an incredibly effective way to arm consumers with the information they seek and need, increase brand awareness, enhance engagement, and ultimately inspire action and conversions. But content marketing isn’t about creating and sharing as much content as possible. It’s about creating quality content that allows you to be the best answer, whenever and wherever your audience is searching. And understanding today’s customer journey will be paramount to your content marketing success. 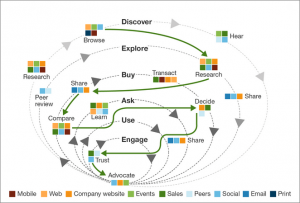 Below is a great illustration from Forrester on the many intricacies that journey can entail. As you can see, it’s not an easy, neat sales funnel these days. The bottom line? Your content marketing efforts have to be optimized in a way that allows you to reach your customers and prospects at multiple touch points during their journey. Below we offer you a few tips and considerations to help you do just that. #1 – Know your audience inside and out. In order to serve your customers and prospects with the best content at the right time, you need to understand their motivations and pain points, as well as the questions they’re asking and where they’re looking for answers. Keyword research and your own site’s analytics are good places to start. When looking at your analytics, pay special attention to your top and worst performing pages, and which sources and devices are driving the most traffic. This will help you understand the kind of content that is or isn’t resonating with your audience, as well as how they like to find content. In addition, get in touch with your sales team. Sales reps are interfacing with prospects and customers on a daily basis, making them amazing resources for gathering insights. The bottom line? You can’t provide answers if you don’t know the questions your audience is asking—and where they’re asking them. So, do your homework. #2 – Take an integrated approach. The customer journey is far from linear, so it’s important that your content marketing strategy integrates a variety of different tactics and channels into the mix for maximum impact. Based on the audience research you’ve done, determine which types of content will be the most effective and engaging at multiple stages of the funnel, and how that content can be optimized to follow SEO best practices and still provide an excellent user experience. Determine how social media channels can be leveraged for sharing content and engaging your audience in conversation or boosting brand awareness. Research and identify influencers who could add credibility and insight to your content, and where they make the most sense to use. Consider the different paid digital advertising options that are available and decide which could be good fits for your audience and content. For more insights on this piece, check out the post How An Integrated Approach Can Help You Become Content Marketing Royalty. #3 – Use a variety of different tactics. To expand a little bit on the content component of an integrated approach, offering content in different formats can enhance user experience by allowing your audience to consume content the way they want to or make it easier for them to take it all in. In addition, depending on where customers and prospects are in the funnel, some content tactics might be more effective than others. Some of the most-used tactics include: blog posts, infographics, eBooks, case studies, email marketing, content curation, and social media. But, depending on your goals, resources and audience, more interactive content such as live video, podcasts or webinars are excellent options. Check out our resource Content Marketing: Definitions & Tactics to discover the basics of 30 different content marketing tactics. #4 – Be relevant and timely. In order to effectively reach your customers and prospects at any point in their journey, content has to be useful, valuable and served up at the right time. Your audience research and knowledge to craft a content plan that includes originally produced evergreen, curated and/or influencer infused content. Also, stay on top of industry news or trends that would allow you to create timely pieces that can get you in on what’s currently being talked about and trending. In addition, plan how you’ll make sure you’re getting the content in front of your audience at the right time to guide them onto the next part of their journey. #5 – Personalize your content to meet your specific audience’s needs. Chances are there isn’t just one type of customer you’re trying to reach, but rather you have a handful of different buyer personas who research, consume and make decisions in different ways. Personalizing your content to different buyers’ journeys will help you serve up that relevant and timely content, and stand out from your competition. #6 – Aim to create a seamless user experience. Every brand has a story to tell. A story that shows their audiences who they are, what they stand for and how they can be of service in a time of need. An important part of successfully conveying that message is through creating a positive, consistent customer experience with your brand on every channel, at every stage of the journey. This is often referred to as omni-channel marketing. Dive deeper into creating a seamless user experience by reading our post: Learn How to Create a Better Customer Experience with Omni-Channel Marketing. #7 – Constantly look for ways to improve the customer journey. You’ve done your audience research. You’ve created and executed an amazing, integrated content marketing strategy and content plan. Now is not the time to set things on autopilot. 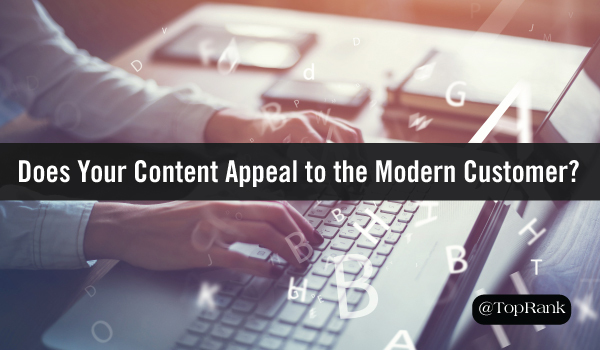 Now is the time to take a look at results and determine areas of opportunity for improving your content and therefore your customer’s journey. Dig into your website and social analytics on a regular basis to see what’s working and what isn’t, and then adjust your content plan and marketing tactics to bolster the good, cut out the bad and perhaps try a little something new. Whether you’re brand is large or small, you can create the perfect tactical mix for creating and sharing content that resonates with your customers and prospects wherever they’re searching and they are in the funnel. With that said, here’s a little something to think about anytime you sit down to create a piece of content. What content marketing tactics have been the most effective for reaching your audience at the various stages of the customer journey? Tell us in the comments section below.